The General Data Protection Regulation (GDPR) governing the way organisations manage personal data comes into force on Friday 25th May. Read more about the GDPR on the ICO’s website here. 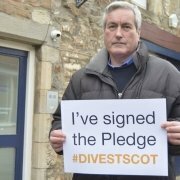 Iain Gray MSP has signed up to a pledge supporting calls for the Scottish Government and Parliament to divest from fossil fuels and invest in a just transition to a zero carbon economy. 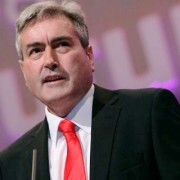 Mr Gray’s support for the Divest Scotland pledge comes as Scottish Labour has committed to ambitious amendments to the Climate Change (Scotland) Bill, including a target of net zero emissions by 2050 at the latest and robust interim target – all underpinned and safeguarded by a Just Transition Commission that is statutory, independent, and well resourced. “I fully agree that the time has come for the Scottish Government and Parliament to make ethical environmental investments for a sustainable future, for workers, communities, children and grandchildren. 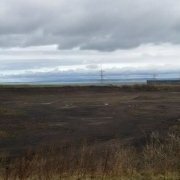 “My colleagues have argued for environmental investment criteria to be central to the Scottish National Investment Bank. It would show leadership and solidarity if the Scottish Parliamentary Pension Scheme led the way in introducing an ethical finance policy. 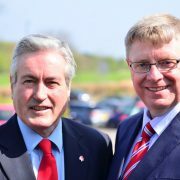 County parliamentarians Iain Gray MSP and Martin Whitfield MP have welcomed the inclusion of East Linton station in a newly-published rail delivery plans for the next five years. The Network Rail Control Period (CP) 6 Delivery Plan for Scotland, which covers the period 2019 to 2024, mentions enhancement of the East Coast Main Line corridor “including early deliverable of new stations at East Linton and Reston”. While no specific date is mentioned for the completion of the project, Mr Gray and Mr Whitfield hope its inclusion in the plan means the important infrastructure will now go ahead by 2024 at the latest. “I have been campaigning for the delivery of the new rail station at East Linton since I first became East Lothian’s MSP in 2007. Successive Rail Ministers have delayed the project over the years, resulting in fears that it would never be implemented. “With the publication of this delivery plan we finally have something more concrete to aim for. I hope that we can now finally see the new station, and consequent local rail services, completed and available for local people as rapidly as possible. “I have raised East Linton station with UK Ministers in Parliament and in ministerial meetings and asked them to press Network Rail to ensure that it is delivered, so I’m pleased to see it in black and white in the new plan. Iain Gray MSP has visited the studio of local artist Andrew Crummy in Cockenzie to find out more about the progress of his new Tapestry about Cancer Survival. Mr Crummy announced his idea for the tapestry last year following his own treatment for cancer. During his treatment and after, he was sketching about his experience, the people he met and the support he received. At this time, it was suggested to Andrew that he should produce a Cancer Tapestry, depicting the treatment, the science and the care involved. He took the idea and ran with it and work on the tapestry began last month. 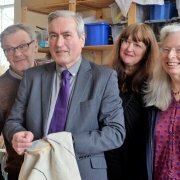 “Andrew and the many volunteers he has worked with have really put East Lothian at the heart of tapestry making in Scotland over recent years, with several amazing pieces of work being produced here. “This new Cancer Tapestry is set to be as spectacular as his previous ones. The tapestry will help to tell the story of those who have survived cancer and celebrate the science and care that goes into treating people with the condition. Anyone interested in participating in the tapestry work should either look for the Cancer Tapestry public group on Facebook or email cancertapestry@gmail.com. 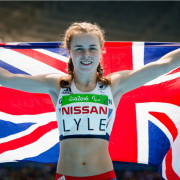 Dunbar athletics star Maria Lyle’s latest success in being named the first-ever Evening Times’ Young Scotswoman of the Year has been recognised in a motion at the Scottish Parliament. The local sprinter’s accolade followed her outstanding success which has seen her become a World and Paralympic medallist and world record holder, as well as adding European gold and a Commonwealth Games silver to her medal collection last year. That the Parliament congratulates the Dunbar athlete and Public Petitions Committee team member, Maria Lyle, on being named the first-ever Evening Times Young Scotswoman of the Year; notes that the award was made in recognition of her outstanding achievements in athletics over recent years, which has seen her become a World and Paralympic medallist and world record holder, as well as adding European gold and a Commonwealth Games silver to her medal collection in 2018; notes that Maria has also become patron of the excellent local charity, East Lothian Special Needs Playscheme, and has been a role model in speaking out about living with cerebral palsy and her own experiences with mental health issues, and commends her on this latest significant achievement. 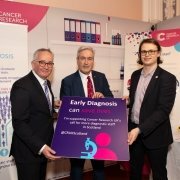 Iain Gray MSP met Cancer Research UK staff at the Scottish Labour party conference in Dundee last week, to learn about the charity’s priorities for beating cancer sooner in Scotland. Mr Gray heard about Cancer Research UK’s latest campaign, which urges the Scottish Government to address shortages in the diagnostic workforce in Scotland. The earlier a cancer is diagnosed the more likely it is to be treated successfully. For some of the most common types of cancer, survival is more than three times likely higher when the disease is diagnosed at its earliest stages. The report also shows that, during the same quarter, only 78.1% of patients received the tests they needed within six weeks. The target is that no one should be waiting longer than six weeks for a test. “The NHS is under continued strain with too many patients still waiting too long for tests, some of which could detect cancer. “With a welcome focus on screening and early detection of cancer, there’s an urgent need to comprehensively address workforce shortages. Iain Gray MSP has lent his support to help improve the lives of people in Scotland living with terminal illness. Meeting with representatives from Marie Curie, the terminal illness charity recently, Iain was interested to hear about efforts to ensure that everyone should get the care and support they need at the end of life. 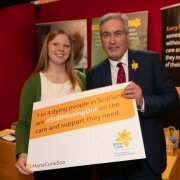 Marie Curie supported over 8,600 people in Scotland last year through their hospices, nursing care and support services. Every five minutes someone dies without the care they need, often missing out on care because they have a condition other than terminal cancer such as organ failure or Dementia, including Alzheimer’s disease and frailty. In Scotland 1 in 4 people (11,000) are still missing out on palliative care at the end of their lives. Coinciding with their annual Great Daffodil Appeal in March, Marie Curie is asking people to donate and wear a daffodil pin to show support for people with all terminal illnesses. 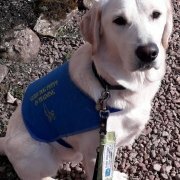 Every donation and daffodil worn helps Marie Curie provide vital care for people living with a terminal illness and support for their families. Iain Gray MSP is urging local residents to respond to the Scottish Government consultation on Good Food Nation legislation. Due to close on the 29th of March, the consultation seeks public views on what should be included in a new law for Scotland’s food system. Scottish Labour have called on the Scottish Government to include a statutory right to food in the Good Food Nation bill. “Reformation of our food system is long overdue. We advertise Scotland as a nation of food and drink and East Lothian in particular is renowned for its local produce, yet over a third of Scots worry about putting food on the table. “An ever-increasing number of people continue to be priced out of a decent diet, forced to rely on food banks and suffering from poor nutrition. We undervalue the people who work to produce and process food, the wildlife, natural resources and farm animals that all form part of our food system. This cannot be allowed to continue. “Scottish Labour believes there should be a statutory right to food which joins up all policies related to food and has the power to measure the government’s success in feeding its people. 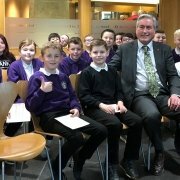 Iain Gray MSP has welcomed two groups of pupils from Sanderson’s Wynd Primary School to the Scottish Parliament. The school took the P6 pupils from Tranent to Holyrood via the Education Outreach service, which helps organise school visits throughout the year. The two groups met with Mr Gray during their visits and had the opportunity to ask him some questions about his role and how decisions are made in Parliament. “It was a pleasure to welcome these two groups of pupils from Sanderson’s Wynd to the Scottish Parliament. They were exceptionally well prepared and had clearly given their questions a great deal of thought.